The Plumbing & Electricians Blog covers content for home owners as well as fellow tradesmen. 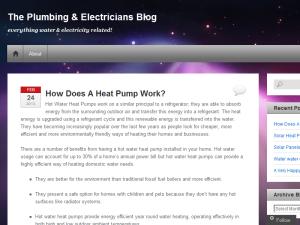 This what your The Plumbing & Electricians Blog Blog Ad will look like to visitors! Of course you will want to use keywords and ad targeting to get the most out of your ad campaign! So purchase an ad space today before there all gone! Hot Water Heat Pumps work on a similar principal to a refrigerator; they are able to absorb energy from the surrounding outdoor air and transfer this energy into a refrigerant. The heat energy is upgraded using a refrigerant cycle and this renewable energy is transferred into the water. They have becoming increasingly popular over the last few years as people look for cheaper, more efficient and more environmentally friendly ways of heating their homes and businesses. There are a number of benefits from having a hot water heat pump installed in your home. Hot water usage can account for up to 30% of a home’s annual power bill but hot water heat pumps can provide a highly efficient way of heating domestic water needs. They are better for the environment than traditional fossil fuel boilers and more efficient. They present a safe option for homes with children and pets because they don’t have any hot surfaces like radiator systems. Hot water heat pumps provide energy efficient year round water heating, operating effectively in both high and low outdoor ambient temperatures. Heat radiates from the ground up. There are no radiators to fit and to place furniture around, meaning you have more flexibility in your home. Hot water heat pumps can detect changes in outdoor ambient conditions and then compensate which ensures that the right amount of heat is produced without excess wastage meaning its better for the environment and for the household budget. The more energy efficient a heating system is, the cheaper it is to run. Hot water heat pumps offer the cheapest kW/h hot water heating available. Hot water heat pumps are multi functional and can be installed for a range of applications from swimming and spa pool heating, to sanitary hot water, under floor heating and fan coil cooling. Using a hot water heat pump to supply energy for a spa pool can help to reduce running costs significantly because it can reduces energy consumption by 3 to 4 times. If looking for a heat pump to run your spa pool, look for one which is resistant to corrosion damage from salt or chlorine water treatment. A common misconception about solar power is that it works on sunlight, and that without it, you can’t get any power. However solar power doesn’t work on heat or direct sunlight but on light intensity, which means solar power works even on overcast days. This makes solar power a great option for most people looking for a renewable energy source however if you are in an area with a low average temperature, then a solar heat pump may not be the best option. As the cost of traditional energy supplies continues to go up, putting pressure on household bills, more and more people are looking for ways to cushion future increases. and a much better CO² balance. Heat pumps work by gathering energy from external sources to heat a home, or can be reversed to gather heat from inside a home, and move it outside, making them the perfect system for all weather types. At its peak, 80% of solar energy can be converted into usable heat. Solar energy and heat pump complement each other here in an ideal way. Depending on need, the heat pump feeds the necessary quantity of heat into the heating system. A solar heat pump doesn’t need solar panels and they use approximately one third of the energy of an electric water heater giving the household a massive saving in the long term. A heat pump transfers the heat in the air outside of the unit to the water stored inside the heater through a heat exchange system. In the case of heat pumps, “heat” is a relative term as they will still work in very cold conditions, so it will still be generating hot water for you during winter nights. In extreme cold, an electric assist is activated to ensure the water stays at the desired temperature. The installation of a solar heat pump is relatively easy although it is always advisable to get an expert to ensure it is installed correctly as a badly installed pump will reduce the benefits. There is no roof space needed and no solar panels. A solar heat pump uses the same connections as an electrical hot water system. As the cost of heating our homes continues to climb, many of us are starting to look at how we can insulate ourselves better from the effects of geopolitics and global energy supplies. Renewable energy is one way which we can help ourselves as well as the wider community and environment. 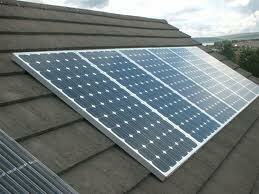 Solar panels are increasingly becoming of interest to many households. A solar panel is collection of photovoltaic cell. These cells can then also be grouped together into a larger system and generate an electricity supply. Whilst not an option for every home, they can be a good option to those who have room to install them. In a residential setting, panels are installed on roofs. The panels don’t work on heat or direct sunlight, but on light intensity, which means they work even on overcast days, making them a viable choice to the UK! Residential systems convert energy from the sun and convert it into electricity. The electricity supply is then used by the residence, and any excess is exported into the national grid, helping to take the pressure off other forms of energy generation. There are many ways to install solar panels at your home. The Government FIT Scheme was brought in to incentivize people to invest in renewable energy and as a result there are a number of companies setting up to fit solar panels for free. The homes get to use the free energy generated by the solar panels installed on their roofs whilst the excess is fed into the national grid with the proceeds going to the installation company. This can be a great way to delve into the renewable energy market without having to shell out a large amount of money. You can of course also buy the panels and have them installed. If you plan on being in the same house for long enough, this can be a great investment. Not only can you make the most of the free energy but you can also make money on the energy your panels feed into the national grid. There are many companies out there who can carry out a survey of your roof and let you know if you are suitable for solar panel installation. There are a lot of deals and ways of having panels installed and it is worth exploring them to ensure you get the right fit for your home and circumstances. The majority of the work is carried out on the exterior of your home which means no redecoration is needed and the installation takes only a few hours meaning it will not disrupt your home and life. Have a look at solar panels today and see if they could make a difference to your home. Our bathrooms have evolved from an out-house and a bowl in the bedroom, through the obligatory turquoise three piece suite of the 80s to being a center of relaxation and tranquility. Functional yet invoking. And they aren’t just restricted to one room anymore either! Baths have broken out from behind the bathroom door to take up prominent positions in bedrooms. 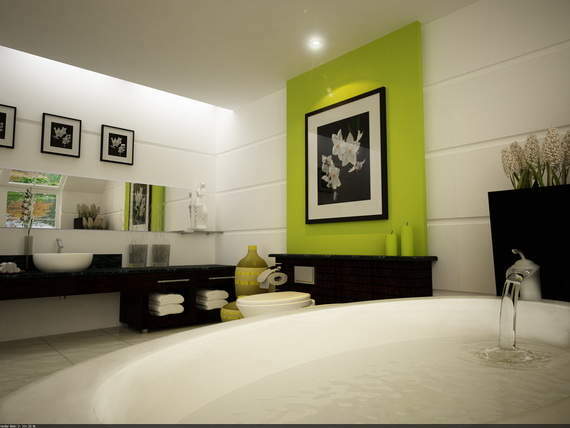 With water flowing from the ceiling or waterfall taps, todays baths are a far cry from the basic baths of yesterday. Showers are also no longer acting like showers. Refusing to be hidden behind plastic screens or shower curtains, todays showers are full of power jets with mood lighting, and are open to the room or discreetly behind a fixed glass panel, positioned to view the water proof on the wall. Let your mind break out of the box and get your creative juices flowing, design the bathroom of your dreams for 2013 ! Add in todays amazing technology and before long you could be coming home to your very own relaxation centre, bath already run from your phone. Have a look below for some inspiration and our current favourites! Everyone at the Plumbing & Electricians Blog would like to wish you all a very Happy New Year! Heres to 2013!!! Everyone at the Plumbing & Electricians Blog would like to wish you all a very Happy New Year! Do I really need a full rewire? Increasingly often we are asked to quote for a complete rewire of a property. More often than not this is either because the property has recently changed hands and the new owners have been told it will probably need a rewire, or a relatively straight forward problem has led to an electrician saying that the Consumer Unit or wiring (or both) don’t meet current regulations and should be replaced. It’s just not as simple as that! In general, domestic electrical wiring has a life expectancy of around 25 years. The actual life span of the wiring and consumer unit will depend on the specific design and installation. Modern demands have changed the way that we use electrical appliances; what might have started off as a kitchen with a couple of plug sockets may, over time, turn into a kitchen with several sockets and additional lighting, perhaps even Separated Extra Low Voltage Lighting creating a bit of ambience as down-lighters under the new kitchen units. Before recommending a rewire we always thoroughly test and inspect the current installation and wiring to BS 7671. More often than not we find that the current installation is essentially fine, provided that Current Carrying Capacity exceeds any additional loads placed on the circuits, and also all that insulation resistance tests show no degradation in the condition of the wiring. In short, some of the oldest wiring installations we have tested have passed with flying colours and are perfectly safe. What’s really needed is thorough testing and inspecting to ensure that your wiring meets the demands of your household and lifestyle. Don’t rush into having an expensive rewire with all the upheaval that is brings without having your current installation thoroughly tested and inspected. You, and your wallet, might be pleasantly surprised! If you are the owner of The Plumbing & Electricians Blog, or someone who enjoys this blog why not upgrade it to a Featured Listing or Permanent Listing?